The evidence of human settlement in Drenthe dates back to prehistoric times, but this largely rural northern province has never attracted many people as a place to live and work, at least not until recently. Drenthe is now part of the Northern Netherlands Provinces (SNN) along with its neighbours Groningen and Friesland. The SNN negotiates with the Dutch government on behalf of its members, which has proved beneficial, as the government recently agreed to co-fund projects that will boost the region’s economic structure. Drenthe is now considered one of the most promising growth areas in Western Europe. Its capital, Assen, is already the fastest-growing urban centre (in terms of population and economy) in the northern Netherlands. 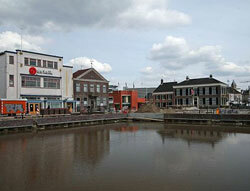 Assen also has a famous motorcycle racing circuit, which has raised the city’s profile considerably. Another popular attraction in Drenthe is the Dierenpark in the municipality of Emmen. It is considered one of the finest zoos in Europe, drawing 1.5 million visitors a year. Large areas of Drenthe remain unspoilt and protected. The appeal of these broad expanses of unpopulated lands, with a village dotted here and there, have attracted many tourists in recent years. In this bicycle-mad country, the province is popular for its hundreds of kilometres’ of bicycle paths winding through forests, heaths and fields, and along the canals of its cities and towns. The main sources of jobs in Drenthe are the agricultural sector and the industries of tourism, energy, and medical equipment production. In recent years a number of business parks and office complexes have sprung up here.